Photo by Daniel Verde '18. Free and open to the public - especially PNCA alumni! Join us for Unlimited, the inaugural exhibition opening of PNCA’s new alumni gallery: PAGE Space! Alumnae Lauren Stumpf MFA ’16 and Jessie Spiess Werner MFA ‘14, with the support of the PNCA Alumni Council, are excited to launch a new Alumni gallery at PNCA this fall. 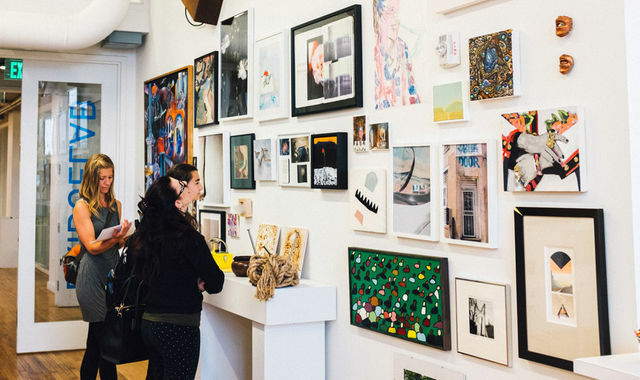 PAGE Space, or the PNCA Alumni Gallery & Exhibition Space, is a dedicated place for the Alumni community to show their work on the PNCA campus. It will be located in the BridgeLab Career Center and will draw its curatorial inspiration from the curious and unique floor plan of BridgeLab. With 20 foot ceilings and a large floorplan, the quantity of Alumni work that can be showcased at one time is vast. Join us on September 7 from 6PM - 9PM for the opening reception! Unlimited, the inaugural exhibition in the gallery, features work by more than 80 alumni artists including: Adam Ciresi MFA ‘17, Adolph Bastendorff ‘09, Aimee Sitarz ‘17, Alanna Risse MFA ‘15, Amanda Wilcox MFA ‘15, Anastasia Greer MFA ‘16, Andrew C Muller-Lorish MFA ‘13, Angela Passalacqua ‘88, Anne Crumpacker MFA ‘11, Annie Oldenburg MFA ‘15, Anya Roberts-Toney MFA ‘14, Ashley Innis ‘17, Barb Gipple ‘87, Barbara Modey ‘05, Bertrand Morin MFA ‘15, Brandi Kruse MFA ‘16, Candace Jahn MFA ‘15, Carolyn Cosgriff ‘04, Coralee Popp ‘91, Cydney French ‘98, Dennis Hauth ‘88, Devin Cogger MFA ‘17, Diane Augee ‘80, Edward Trover MFA ‘13, Eileen Kane ‘87, Elisabeth Young ‘17, Elizabeth Ellis ‘08, Erin Dengerink MFA ‘13, Gavin Eveland ‘09, Jason Berlin MFA ‘16, Jenna Reineking MFA ‘17, Jennifer Cooke MFA ‘15, Jessalyn Haggenjos ‘01, John Dougherty MFA ‘14, Joshua Hughes ‘17, Judith Sturdevant ‘12, Kathleen Cosgrove ‘03, Kathy Bayless ‘85, Kelly McGovern MFA ‘15, Kyle Raquipiso ‘12, Lauren Seiffert MFA ‘14, Lauren Sinner MFA ‘16, LeeAnne Gibney ‘03, Linda Hutchins ‘88, Linda Neufer ‘78 BA, Lisa Brinkman ‘93, Lynda Ater ‘01, M. V. Moran MFA ‘16, Maddie Maschger ‘16, Madeleine Caley ‘95, Maggie-Rose Condit MFA ‘16, Margaret Sutko ‘96, Maria Davidoff MFA ‘15, Marico Fayre ‘05, Marilyn (Skalberg) Darrell ‘12, Mary Jo Cook ‘74, Mary Weisenburger ‘15, Meghann Gilligan MFA ’14, Mikayla Carpenter ‘16, Nick Patton MFA ‘15, Patricia Lynch ‘00, Philip Broussard ‘82, Rachael Allen ‘03, Rachel Haywood ‘11, Rachel Wolf MFA ‘14, Ralph Turner ‘58, Rhonda Vanover MFA ‘14, Richard York MFA ‘14, Robin Becic ‘83, Ruth Lantz MFA ’10, Ryan Bubnis ‘16, Sandra Green ‘84, Sarah Abbott MFA ‘14, Sarah Farahat ‘08, Tammy Jo Wilson ‘03, Theresa Provitola ‘03, Tim Janchar MFA ‘13, Tim Stigliano MFA ‘12, Tom Leach ‘70, Veronica Reeves MFA ‘15, Vincent Aloia MFA ‘17, and Wilder Schmaltz ‘01. PAGE Space (the PNCA Alumni Gallery and Exhibition Space), was launched in Fall 2017 with support and funding from the PNCA Alumni Council. Housed within BridgeLab Career Services, PAGE Space is a dedicated exhibition space for the PNCA Alumni community to exhibit new works and projects. In its pilot year, PAGE Space presented work by over 80 PNCA Alumni. The Gallery is also the recipient of a 2018 Project Grant from The Ford Family Foundation. PAGE Space has become an on-campus hub for the alumni community to connect with each other and with current PNCA students, faculty, and staff. PAGE Space is curated and managed by PNCA alumnae Lauren Stumpf MFA ’16 and Jessie Spiess Werner MFA ‘14.